The New York Times bestseller-a guide through the twelve technological imperatives that will shape the next thirty years and transform our lives. 3.0 out of 5 starsAn interesting take on how technology is shaping the future. This book contains some interesting ideas for how the future will be shaped and how current technological trends are shaping society. Some of the ideas seem quite possible, while I feel others may only be mere speculation. I did find the book hard going at times. While I can understand the lengthy descriptions of the future I did tire of them. I actually thought the book would be more technical than it was. Overall, not too bad a read if you are interested in how technology is shaping the future. 4.0 out of 5 starsLooking ahead with positivity and awe. This is a fantastic read, a reinforcement that there is a lot to look forwards to and that being alive will only continue to get better. This book is well researched, well written and exciting to read. see that future, but it sure was fun to visualize it. When I saw that Mr. Kelly was a founder of the magazine Wired, I knew that I wanted to read this book. I admire Wired because I think it looks carefully at technology and thinks for itself, which I find admirable. So, what does the book say? The author looks back over the 30 years that he's had his ringside seat, considers what he's seen and predicted over that 30 years and then he projects forward over the next 30 years to see where he thinks technology will take us. He clearly states that he considers the positive aspects of future change, not the negative aspects. The author predicts that certain technological trends or impulses are inevitable, not specific outcomes. So, don't expect to see predictions of a world free of war or cures for all cancers, that's not what he views as the what he terms "bias" of technological change. He identifies 12 of these biases and discusses how they have played out over the 30 years that he's been observing them and how he thinks they'll evolve over the next 30 years. For instance, he views telephony as inevitable, but the iPhone was not. The internet was inevitable, but the specific form of internet that we presently have was not. I'll touch on a few of the 12 and encourage you to read the book for the full observations. Flowing - the book describes the internet as the world's largest copying machine. Information in many forms is copied and distributed. usually for free. The industrial revolution brought analog copies of information such as music. These copies were exact and cheap. The internet brings digital music - exact and free. This affects value propositions and law, which causes change. He considers how this change and looks for responses to this change. Trust may become even more valuable. Screening - where once we may have been people who read books and did things "by the book," the author argues that we are now people of the screen (the computer screen). People of the Screen live "in a world of constant flux." Paperback at pg. 88. As he says, "truth is not delivered by authors and authorities, but is assembled in real time piece by piece by the audience themselves." Pg. 88. I'll let you decide how this may be playing out in society today. Questioning - Wikipedia was a great shock to the author. When Wikipedia began, Mr. Kelly could not believe that it would be anything other than an abject failure. As he says, "I knew from my own 20-year experience that you could not rely upon what you read from a random stranger.... I believed that an aggregation of random contributions would be a total mess" Pg. 269. The ability to many people to self-organize through the internet a reasonably coherent body of information was eye opening. "I am looking forward to having my mind changed a lot in the coming years." Pg. 274. The author describes "becoming, cognifying, flowing, screening, accessing, sharing, filtering, remixing,interacting, tracking, questioning, and beginning" as areas in which change is inevitable. In all of these I find the "tracking" most troubling. But, like the author, with the passage of time, I may find my mind changed a lot. I encourage you to read the book and see if it challenges your mind. 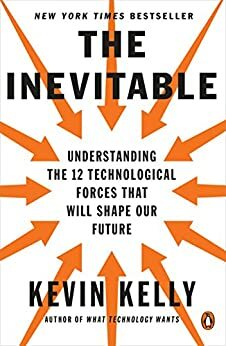 Kevin Kelly is at it again with this book that looks at what the future has for us in the next 30 years, with each of the 12 forces described being a broad theme (i.e. Sharing, Screening, Accessing, etc.) that we can easily recognize today as happening but he explains in a broader context and outlines where it will take us. Unlike other authors, who only look forward and disregard what has been said before, Kelly was actually a pioneer of the Internet when it was at its embryonic stage in the 1980s and reflects on how wrong the 20-30 year predictions from that time were, including his own. So when, after all that he has seen, when seemingly all the valuable Internet real estate has been taken, he makes the bold statement at the end of the first chapter that "Right now, today, in 2016, is the best time to start up...This is the moment that folks in the future will look back at and say 'Oh, to have been alive back then'", he grabs and holds your attention for the rest of the book. This is a book that whose ideas are meant to be slowly pondered on, not to be gobbled up quickly. As in his previous works there is an underlying sense that technology has a will of its own, it wants to go in a certain direction which we would do well to align with. What I found most illustrative were the scenarios at the end of each chapter where he shows what life in the future looks like after the technological force described in it has had enough time to play out, a positive take on what popular TV shows like Black Mirror paint in a very dark way. The optimism that pervades the book requires the reader to take the long view, to look beyond the present state. At a time when we are bombarded with news stories about the disappearance of privacy, the surveillance state, cyberwarfare, and the automation of millions of jobs out of existence Kelly can come across as a hopeless Pollyanna, and when he claims that "propaganda is less effective in a world of screens, because while misinformation travels as fast as electrons corrections do too" calling this naive is too soft a word after a US election where fake news played a big role and traditional fact checking could not penetrate the social media bubbles we now live in. But like Kelly says when describing the Becoming force, technology is still evolving and just because we don't have a solution today to these problems doesn't mean that they will not eventually arise after these forces have run their course. With that confidence we can best appreciate what Kelly has to say.